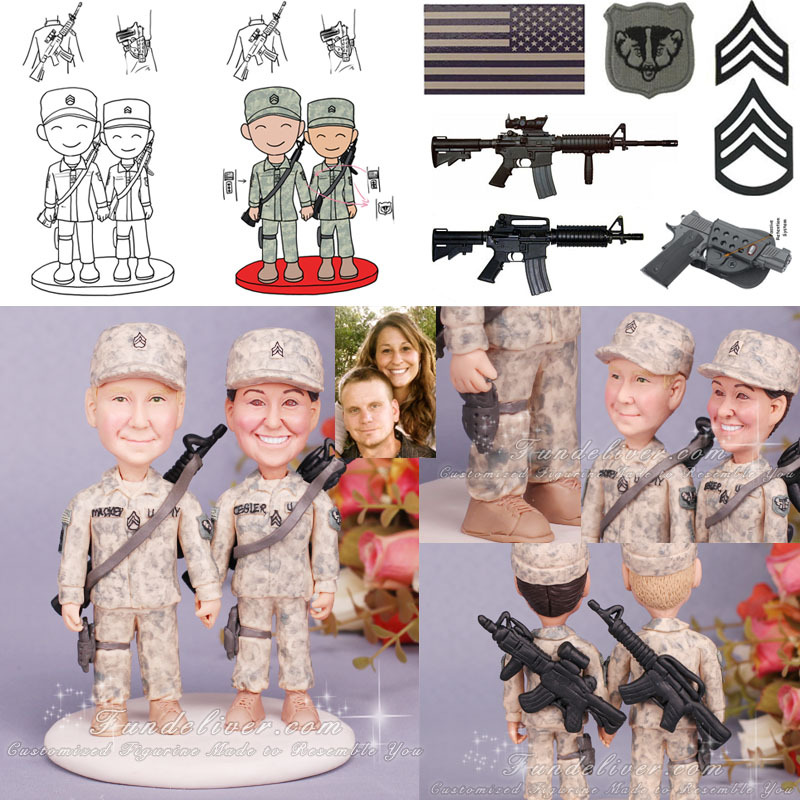 This is a completely customized Army wedding cake topper ordered by one of our customers. The groom is a SSG (Staff Sergeant) E-6 rank in the U.S. Army, and the bride is a SGT (Sergeant) E-5 rank in the U.S. Army. They would like the groom and bride figurine to be in their ACU digital Army uniform with their weapons (pistols in the holster on their right legs and M4 slung on their backs), since Iraq is where their story began. They would like the SSG rank and SGT rank to be on their ACU digital Army uniform which is located on top of the hat and in the middle chest section of the uniform. On the right shoulder is the American flag. Under the American flag bride has a Red Arrow path and groom has a Engineers path. On their left shoulder they both have the Badger patch. Love this Army wedding cake topper? No matter what type of armed forces you join, we can just sculpt your figurines to match your career perfectly. Don’t forget to check the following products to know more information about similar Marine Corps Wedding Cake Toppers, Naval Aviator Cake Toppers and Navy Wedding Cake Toppers.